This is a best-of modification of three online recipes I’ve tested. Chicken Tikka Masala is heavily British-influenced – it is not a recipe culturally-tied to native India. 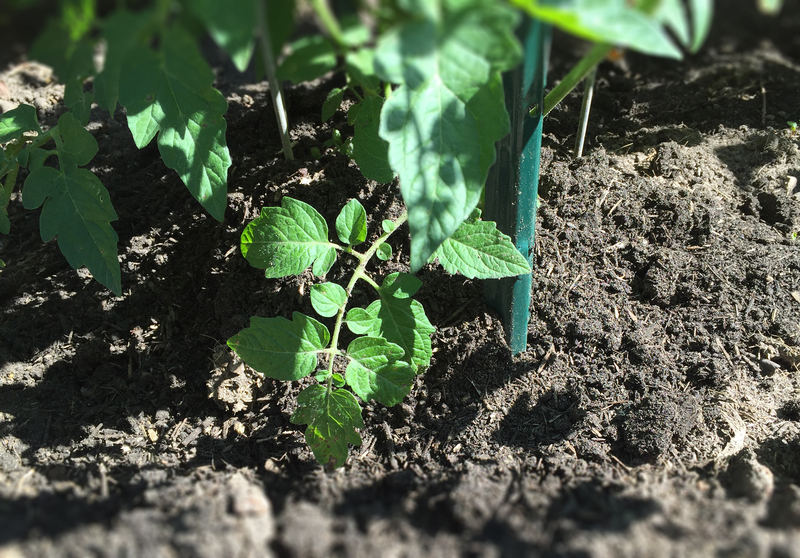 Enjoy – this is one of my favorites; I love it paired with grilled asparagus. In a large bowl, combine the marinade ingredients and mix well with a spatula. Score the chicken with a sharp paring knife in 1/2″ increments. Place the marinade in a Zip-Lok® bag with the chicken and coat evenly. Place in fridge for 24 hours. The next day, preheat a grill with enough charcoal for a medium-hot fire. Scrap off the excess marinade from the chicken and place in the center of the grate with coals leveled and cover – grilling at least 5 minutes per side, or until charred but juicy. Remove and let cool on a platter. In a large, heavy wok, heat 2 tbs. butter until melted and add the onion, garlic and jalapeno. Cook until golden and fragrant – about ten minutes. Add the dry Indian spices, the tomato sauce, and the crushed plum tomatoes. Cook until slightly reduced (about 15-20 minutes). Cube the chicken and add to the wok. Slowly add the heavy cream, stirring constantly. Reduce until thick, (about 10 minutes). When ready to serve, add the chopped cilantro and spoon over cooked Basmati rice with your choice of a vegetable for a side dish. This is a simple stir-fry recipe that can be used with any fresh vegetables that you have on hand. Just make sure to cut them in small, even pieces. The seasoning is light and flavorful. If you prefer it spicy, add a couple of crushed chilies to the wok oil before frying. A properly-heated wok is a must with this recipe to ensure that the veggies don’t get soggy. My electric flat-top stove doesn’t generate enough heat so I use my cast-iron Lodge wok on a 22″ Weber grill over real wood charcoal until it’s blistering hot. 2 scallions (green stalk onions), washed, split and quartered with roots removed. Prepare all vegetables and seasoning before cooking. This recipe cooks fast – it will be done in four minutes once it hits the wok. Trim all vegetables and pat dry. Let warm up to room temperature before placing in the wok. Combine the minced garlic, ginger, 2 tbs. soy sauce and 1 tsp. sesame oil in a small mixing bowl. Mix well and set aside. Heat a wok over high heat until it smokes. Add the 2 tbs. peanut oil and swirl to coat the sides of the wok. When it just starts to smoke test the temperature by adding a drop of water to the side of the wok. It should sizzle and evaporate almost instantly. Add the ginger and garlic mixture to the wok and quickly stir fry using a wok ladle or two silicone spatulas to avoid scorching until just aromatic. On a very hot wok this should take no more than 30 seconds. Immediately add the vegetables and stir to coat well. Let sit for a minute. Stir briefly, let sit for an additional minute to sear. Stir well to incorporate and remove when just crisp-tender – about four minutes total. 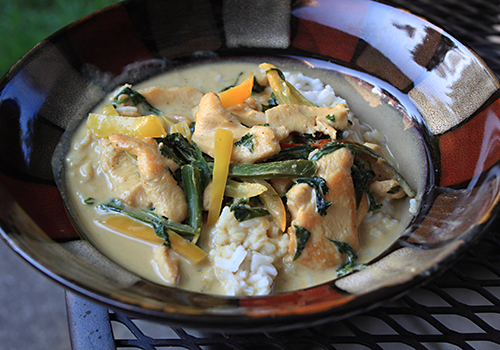 Serve with steamed white rice and your choice of a dinner selection. Here’s a great Chinese recipe that surpasses any takeout meal. Using a wok effectively with controlled high heat takes a bit of practice – but the results are fantastic. Take care not to stir the chicken too much when frying, or the batter will flake off. Place the cut chicken breast pieces into a mixing bowl with 2 tablespoons of soy sauce and ½ teaspoon of salt. Mix well, cover and marinate in the refrigerator for at least 1 hour. To make the batter – beat 2 large eggs with ¼ cup of cornstarch, a pinch of white pepper and baking powder. Thoroughly coat the chicken with the batter. 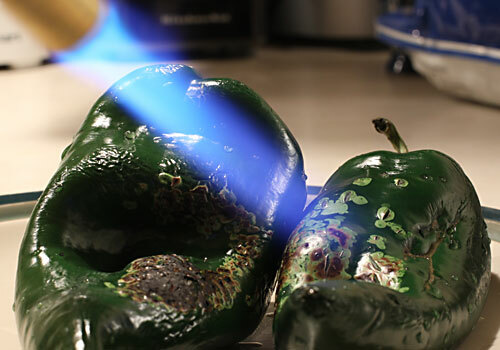 Heat a deep fryer or wok to 350 degrees with one quart of vegetable oil. Deep-fry the chicken in batches until fully cooked and golden brown. Caution: Adding cold food to hot oil will cause the oil to splatter! Let the chicken warm up before adding to the deep fryer or wok. Drain the chicken on paper towels in a covered baking dish to keep it hot. Prepare the lemon sauce – combine 1/4 cup of sugar, 1 tablespoons cornstarch, 1 cup chicken broth, 1/4 cup lemon juice, and ¾ teaspoon salt. Mix until well combined and add 3 slices of lemon to the sauce mixture. 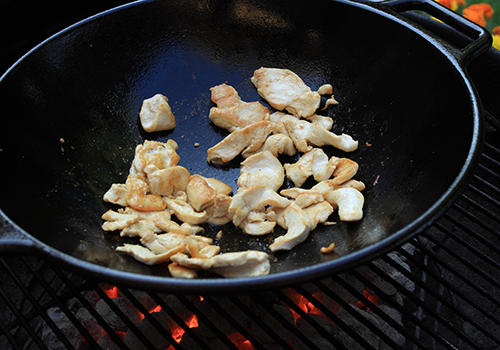 Heat two tablespoons of peanut oil in your wok until it ripples and add the chicken back into the wok. Stir-fry until just crisp and heated through. Stir in the lemon sauce mixture. Mix well until the sauce becomes clear and reduced, about one to two minutes. Remove immediately. Serve with steamed white rice and broccoli. Note: for a thicker, crispier coating, dip the chicken pieces in corn starch or flour after removing from the marinade. Then dip in beaten egg. Coat the pieces in corn starch or flour again. Then coat in the batter and fry as instructed. Thai food is some of the hottest cuisine you will ever experience. There is a small restaurant in Green Bay called Nukeo’s which serves some of the best Thai food around. They also know how to make it HOT, and when I say hot, I mean a blistering, equatorial, heart-stopping blackout hellacious burn. Fairweather foodies will need to turn elsewhere for a meal. This recipe is a quick, authentic rendition of my favorite item at Nukeo’s. Traditionally made with green curry paste and garam masala. Using two deep, heavy skillets (preferrable cast-iron), or a wok, flash-fry the chicken breasts on medium-high in two tbs. peanut oil, turning once until no longer pink. Drain off fat and reserve on cutting board for five minutes. Slice into 1/8″ strips, transfer to one of the skillets and reduce heat to medium. Add the chicken stock, soy sauce, curry paste, balti seasoning. 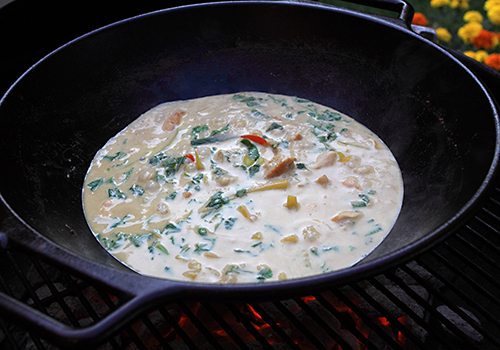 Stir well and add the coconut milk, pineapple juice, green peppers, dry chili and garlic. Bring to a rolling boil and add the basil, lime and cilantro. Simmer for ten minutes until reduced. Careful with the soy sauce; the curry paste and Balti seasoning have a lot of salt. Serve spooned on hot cooked white rice.